How does a guy who plays what I would call honky-tonk end up converting to the church of New Age music? Sheer creativity. Richard Carr began his career playing in bars in the French Quarter of New Orleans. That might explain how he knew his way around the area when I first met him. He also has quite a hold on the practice of using music to heal. Furthermore, he is noted for creating music for specific occasions and purposes tailored to the listener. 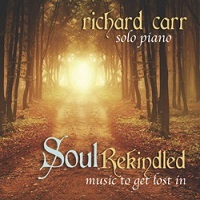 He offers ten tracks of solo piano music for us on his latest release Soul Rekindled, subtitled, Music To Get Lost In. He even presents a labyrinth on the disc face, a metaphoric maze for those that are battling the evils of cancer and, through his music, offers a bit of hope, a lot of comfort and perhaps a way out of the maze. Richard opens the album with a track called New Beginning. The upbeat melody presents a new horizon for one to gravitate towards and offers a light at the end of the tunnel. The music volunteers to be a guide and maybe even coach. Just follow along. Questions, with its gradual pace, allows one to ponder the imponderable without fear. I do not know what kind of dread accompanies a long illness, but I know of fear. The music is neutral ground. You can ask without repercussions, but unfortunately no answers are guaranteed. Forgiveness. I never get tired of writing about this subject only because I learned the hard way. Richard's gentle tune called Forgiveness is a transformation from recognition to action. My experience is that there are two kinds of forgiveness which have equal weight. The first is the forgiveness of others, those which erred, hurt, maligned or forgot you. The other may be more important for it is the forgiveness of one’s self. Either one is a burden that should not be carried for very long. One of my favorites on Soul Rekindled is called Finding the Treasure Within. With all the technical and digital data at our fingertips these days, we tend to forget that the answers may be found in each of us. And each answer is a reward in itself. Asking the right question or searching deep enough to get the results may be long in coming, but the music reminds us to keep on going. The last cut, Idaho, is the only live performance on the album and it is inspired by one of the circumstances than required Richard's special touch. It sounds like a good improvisation to a fond memory. Whether it was clean white snow, cascading waterfalls or mountainous landscapes or that someone that made your dreams come true that led to the creation of the music, it sounds like the music added just the right colors. Richard Carr has released more than a dozen albums that reflect his migration from one state to another (and not just geographically) and with the inspiration to heal the mind and body. He continues to teach and compose in St. Louis, but his music is far reaching.